We were on scene at the National High School Cheerleading Championship in Orlando, Florida on February 10-11 to watch over 700 of the top high school JV and Varsity teams duke it out for the coveted white satin National Champion jackets! Click here to read a recap and view results from the competition! On the Friday before Jamfest Super Nationals, top level 5 teams from all over the country gathered to compete at the exclusive, invite-only Majors competition. Click here to view scores and results from the competition! Team USA has announced the members of the 2018 All Girl and Coed teams! Click here to see who made the cut! 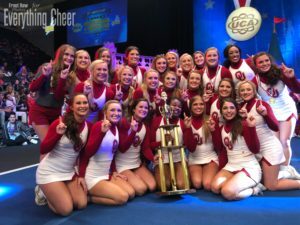 We spent the weekend at Disney’s Wide World of Sports complex, where collegiate cheer teams from all over the United States gathered to compete at UCA College Nationals. Visit our News page to view a recap and results from the competition! This weekend, all eyes were on Vegas as some of the best teams from the West Coast converged on the Mirage hotel for the American Grand competition. Three full paid Worlds bids and 6 at large Worlds bids were up for grabs. View results and a list of bid winners on our News page! 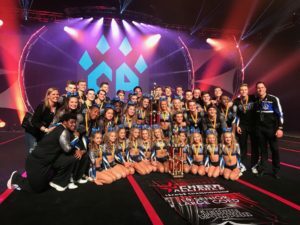 The two days after the Cheer Alliance Championship in Louisville, on December 9-10, many L5 teams stayed to compete at WSF for a chance to earn one of 4 full paid Worlds bids and 8 at large Worlds bids. View a complete list of L5 competition and bid results on our News page! Competition season is officially underway, and last weekend it kicked off with the first big national invitation-only competition of the year; the Cheer Alliance Championship. Visit our News page to view competition results and scores! We were at Florida Top Dog’s showcase in Largo, Florida on Sunday, scoping out what their teams plan on bringing to the competition mat this season. Florida Top Dog has seven full-year teams competing this season, ranging from mini 1 to senior coed 5. Read a recap of each team’s performance and view photo galleries of each team. The Majors have announced which teams will be attending their 2018 competition! Click here to see which teams and divisions will be featured at this season’s invite-only event!